“Today, after many months of hard work and planning, our journey back to Being Co-op has begun. Here’s what we announced to our members at the AGM in Manchester. The enthusiasm from nearly a thousand members in the room as we made the big announcements was tremendous. We’ve certainly come a long way in the last 18 months since we began our Rebuild of the Co-op. Our new Co-op Membership, which colleagues will use from the summer and all our members from the autumn, is the biggest innovation in our membership for decades. Every time you buy Co-op branded products or services – from a loaf of bread to a funeral plan – and swipe your membership card, we’ll give you back 5% of what you’ve spent. You can then use that reward against your next purchase or save it for another time. On top of this we’re going to add something that will bring to life our commitment to communities. We’ll give 1% of the value of the Co-op branded products you buy to local causes that you’ve chosen. And finally, when we’ve completed our investment in rebuilding our Co-op, we’ll bring back the much loved ‘Divi’ – our annual share of profits to our members. We’ve identified 1,500 local communities, based around our Food stores and Funeralcare homes. Local community groups in each area have the chance to benefit from the new 1%. That means up to 4,500 local causes will be supported by our new Co-op Membership. By 2018 we expect to give £100m a year back to our members and their communities, through the 5% and 1% rewards. As I announced to colleagues at the beginning of the month, we’re changing our look and bringing back the iconic blue clover-leaf logo to once again draw attention to all we stand for. By Monday we’ll have rebranded seven Food stores and three Funeral Homes across the country in the new look, with many more in the next few months. In our Food stores more than 600 products will be in the newly branded packaging by the end of next week. For all of our businesses we’re changing our look online and creating new point of sale literature. The rebrand of the entire estate will take between 3 and 5 years and we’ll achieve it as part of our normal refit programme. Next week our Back to Being Co-op experience for all 70,000 of our colleagues begins in locations across the country. I made it very clear to our members today that we see our colleagues as our greatest champions. 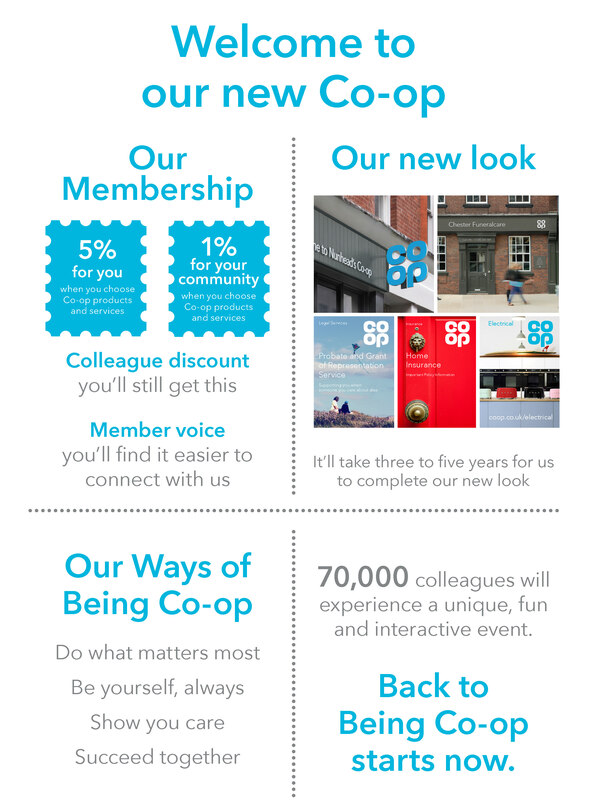 We want you to know better than anyone what Being Co-op means for our members, our customers and for each other. There was one more important announcement today. We’ve passed £1.5m in our national fundraising to tackle loneliness in partnership with the British Red Cross. That’s a fantastic achievement. We’re on track to reach our £.3.5m target next year. These are exciting times for us all. Our Co-op is back and proving we can do things in a different and special way. Could anyone look into the archives to confirm who was involved in the original design. I believe a relative of mine,Surname -Preston with, I believe, the Christian Name -Mark was involved. Perhaps community 1% funding will be more meaningful if the issue matters to the community and mot to the most politically biased of those in charge of deciding the fate of selecting the projects funded eh? I’d just like to say well done with the use of different colours to make the new packaging of products stand out. Unfortunately, I think your designers have made a mistake with the size of font or writing on the products. You can’t see what it says! You need a magnifying glass to read what the item actually is. I was looking for thick sliced wholemeal bread recently and it really did take ages to find it because the writing on all the packs was so small. Maybe you’re expecting customers to ‘get used to’ the new colours? I think you’ll have to think it out again…..thanks. I am afraid changing the sign above the shop does NOT work. It is aboutselling the right products. We need to stock what customer wants and NOT spend millions on new signage. Shame about the employees pension that have changed for the worse all the years paid into it ..also long standing employees who have had a pay freeze until the other employees catch up 30 years service and that’s how you treat the older loyal staff..where’s the money come for this ? Wow love the new look gray blue love the gray and blue coop over the gray been working now for 27 years seen all kinds of change uniforms and other change it is good the higher managers up the line are starting to take notice . Listen act fix . I seeing a big change in colours in the food range so more better then be for along with dome new eye watering new lines in the food range on ready meals fruit and veg the new colours to the eyes is more saving come on pick me up I am tasty to pick up and eat . They do look so good about time . I do the speaking on the shop floor sound microphone over the day I can now feel even more free to talk on our food lines to our store customers and members lots dying they like e new look and members who been with coop all there life’s saying they like it being and saying coop once more so keep taking note please of us front line team members as we are remember of our coop our selfs we own part of the coop . So how about showing this to us all staff have a saying as members of our coop and we own part of it . Nothing is Said of this we work hard as a team what ever store we in and about time we being taken notice off but needs to be shown this more . Pity the plan is to brand the lorries .co.uk instead of .coop, as we are a Co-operative. Where is the Co-op Marque in the new branding?